SAN FRANCISCO (June 5, 2017) — City Attorney Dennis Herrera today issued subpoenas to Uber and Lyft to turn over records on driving practices, disability access and service in San Francisco. Herrera also simultaneously made a public records request to the California Public Utilities Commission for that information. The City Attorney aims to ensure that the two companies’ estimated 45,000 vehicles in San Francisco comply with local and state laws, including ensuring equality of access, and do not jeopardize public safety or create a public nuisance. 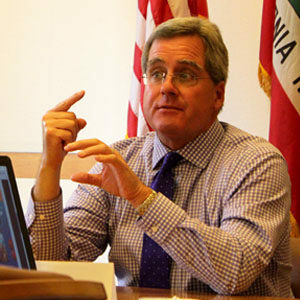 The administrative subpoenas seek four years of records in eight categories, including miles and hours logged by drivers, incentives that encourage drivers to “commute” from as far away as Fresno or Los Angeles, driver guidance and training, accessible vehicle information, and the services provided to residents of every San Francisco neighborhood. The San Francisco Municipal Transportation Agency, which manages the city’s streets, bikeways, taxis and transit system, has faced much of the impact from ride-hailing companies. San Francisco is committed to Vision Zero — eliminating traffic deaths by 2024 — and has ambitious environmental targets, including reducing greenhouse gas emissions to 40 percent below 1990 levels by 2025. The California Public Utilities Commission, or CPUC, has regulatory authority over the ride-hailing services, which it officially designates as “transportation network companies,” or TNCs. The CPUC requires transportation network companies like Uber and Lyft to file annual reports. But to date the CPUC has not disclosed those reports to the public or to the SFMTA, despite the agency’s long-standing request that it do so. effect on demand or need for parking in San Francisco. San Francisco Administrative Code 12V, the Personal Services Minimum Contractual Rate Ordinance, which sets minimum compensation for contractors working more than 20 hours a month. Uber and Lyft have 15 days to comply with the subpoenas. Failure to do so can result in a finding of contempt and other court-imposed penalties. The move comes after Herrera filed suit against Uber on May 11 to compel the company to comply with a subpoena from Treasurer José Cisneros. That subpoena requires Uber to provide business records containing driver contact information so city officials can ensure the drivers are registered to do business here. Uber is fighting that subpoena, with the matter scheduled to be heard on June 22 in San Francisco Superior Court.